Mary Robinson, President of Mary Robinson Foundation – Climate Change, will present the talk, “Everybody Matters: Climate Change and Human Rights,” on Thursday, March 12, at 6 pm in Centennial Hall on the University of Arizona campus. Doors open at 5 pm. 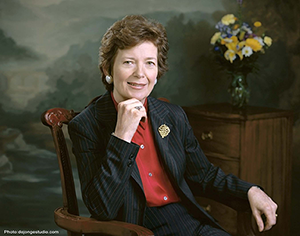 Robinson, who served as the first woman president of Ireland from 1990 to 1997, U.N. High Commissioner for Human Rights from 1997 to 2002, and is now the UN Special Envoy for Climate Change, will discuss the importance of including the most vulnerable populations of the world in solutions to climate change. The Haury Trust is pleased to sponsor this program because the southwestern U.S. is a region where climate change will have disproportionate impacts on poor, indigenous and other often disadvantaged people. The lecture is open to the public and free to attendees.